Bootstrap is really a zero cost front-end framework that creates for faster and also effortless website development expertise. Bootstrap really helps to produce responsive, mobile-first projects quite easily. This is an ability of the website to instantly adjust to any screen dimension and resolution. Along with the expanding fascination with smartphones, how many users who log on to the sites from devices has increased significantly. This sort of feature allows you to adjust websites to cellular devices and a variety of screen extensions, eventually offering cellphone users with improved opportunities. In what cases I don't need the extended license for Fashion & Beauty OpenCart design themes? No, we design OpenCart ecommerce templates for Fashion optimized for web resolution only. Can I apply a discount code to a discounted OpenCart design theme for Fashion & Beauty or combine several discount codes together to get better price? What is Developers License for Fashion & Beauty News OpenCart design? If you purchase a Developer's license, you are granted a non-exclusive permission to use the Fashion & Beauty News OpenCart design on up to 5 domains for projects belonging to either you or your client. Can I resell the OpenCart ecommerce templates for Jewelry I bought the extended license for? No, you cannot resell the OpenCart ecommerce templates for Jewelry as is. You can only sell them as the integral part of your new product. I would like to make payment for OpenCart theme for Beauty by company check. Is that possible? Please use Skrill payment option. They accept payments by check.You can place an order for OpenCart theme for Beauty on the site under the name of the company and choose Skrill merchant system for making payment from the company's account. To initiate bank transfer, please create an account here - www.skrill.com, add the number of your bank account and verify it. After that, you can place an order on our website and choose Skrill on checkout page. When the payment is made, the product will be sent to your e-mail along with the invoice under the name of your company. What is the difference between unique and non-unique OpenCart design theme for Fashion Beauty purchase? Non-unique purchase:Non-exclusive purchase means that other people can buy the OpenCart design theme for Fashion Beauty you have chosen some time later. Unique purchase:Exclusive purchase guarantees that you are the last person to buy this template. After an exclusive purchase occurs the template is being permanently removed from the sales directory and will never be available to other customers again. Only you and people who bought the template before you will own it. What is a buyout purchase license for OpenCart design for Jewelry? If you purchase the product at a 'Buyout price' it guarantees that you are the last person to buy this template from us. It means that this OpenCart design for Jewelry may have been sold before a couple of times (see 'Downloads' number in item's properties) but only you and people who bought the template before you will own it. After this kind of purchase the template is being permanently removed from our sales directory and is never available to other customers again. The buyout purchase license allows you to develop the unlimited number of projects based on this template, but the template should be customized differently for every project. Is it possible to use your Beauty OpenCart design themes to develop websites for my customers? Yes. It is perfect for designers who want to offer their customers a high-quality design and also save time and money. Keep in mind that when you purchase the OpenCart design for Fashion & Beauty Blog with ordinary or exclusive license you're entitled to create only one project (one domain name). How many applications, programs etc can I use to integrate with the OpenCart design themes for Jewelry Designer under one extended license? 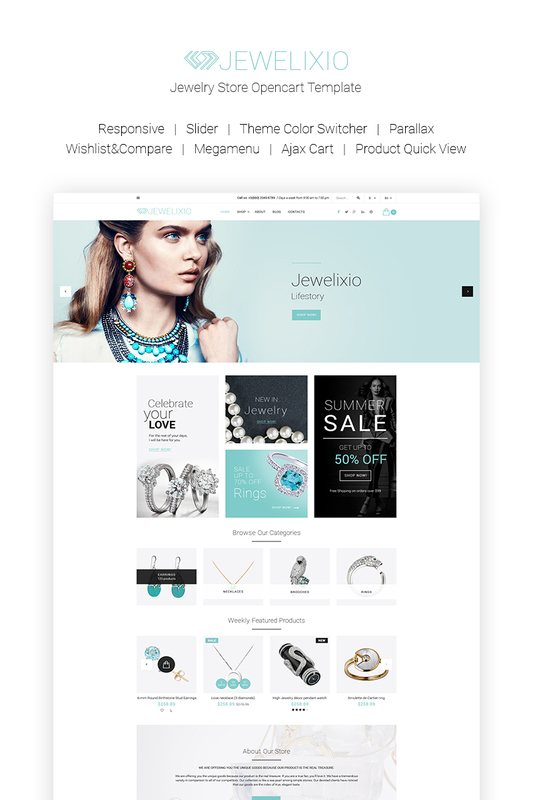 The extended license gives you the right to use the purchased OpenCart design themes for Jewelry Designer for the integration with one software/freeware/application/CMS/sitebuilder only. In case you would like to use the template with the other application, the other license is to be acquired. Are there any discounts if I'm buying over 10, 20, 30 or more Fashion & Beauty News OpenCart design? Please email to marketing@templatemonster.com with your inquiries about OpenCart ecommerce themes for Jewelry Accessories . Can I put a line at the bottom (or any other spot) of my new product "Website development by Company name" after purchasing OpenCart design theme for Jewelry Factory ? Yes, you can place a note at the bottom (or any other spot) of my product "Website development by Company name". Nevertheless, you cannot place "Website design by Company name" while using one of OpenCart design theme for Jewelry Factory . Can I contact the Fashion & Beauty Store OpenCart ecommerce template author? Yes. You can contact this Fashion & Beauty Store OpenCart ecommerce template author/author's team directly using your personal account under the Support tab. How can I modify OpenCart theme for Beauty to suit my particular website? Please visit our Online Help Center to obtain detailed instructions on editing OpenCart theme for Beauty. Can I integrate the OpenCart design for Handmade Jewelry with third-party software or applications for development of my new products? No, you cannot get the developers license for development of OpenCart design for Handmade Jewelry or other products. Can I resell the OpenCart design for Jewelry Engraving as is? No, you cannot resell the OpenCart design for Jewelry Engraving as is. Can I put low resolution thumbnails of OpenCart designs for Fashion & Beauty on my website for my clients to choose designs? I have customized the OpenCart design theme for Fashion Beauty and would like to protect my content by copyright, can I place Copyright, Mycompanyname.com? After OpenCart design theme for Fashion Beauty purchase you can put your copyright to the template. But you cannot place a line at the bottom (or any other spot) of the customized project saying "Website design by Company name". Nevertheless, you can place "Customized by Company name". Are there any limitations on selling the Fashion & Beauty Store OpenCart ecommerce template as the integral part of my new product? Is it possible to buy the particular image from the OpenCart design for Jewelry Accessories ? No. According to our Terms and Conditions we never sell the images separately from OpenCart ecommerce templates for Fashion (as well as the templates separately from the images). What is a unique purchase license for OpenCart design for Fashion & Beauty Magazine? If you purchase the product at a 'Unique price' it guarantees that you are the first and the last person to buy this OpenCart design for Fashion & Beauty Magazine from us. It means that this template has not been sold before and you become an owner of a unique design. After this kind of purchase the template is being permanently removed from our sales directory and is never available to other customers again. The unique purchase license allows you to develop the unlimited number of projects based on this template, but the template should be customized differently for every project. Are there any restrictions for using imagery, cliparts and fonts from the Jewelry Shop OpenCart ecommerce template I purchased? All imagery, clipart and fonts used in Jewelry Shop OpenCart ecommerce template are royalty-free, if not stated otherwise on the product page, and are the integral part of our products. One Time Usage License and Developers License give you the right to use images, clipart and fonts only as a part of the website you build using your template. You can use imagery, clipart and fonts to develop one project only. Any kind of separate usage or distribution is strictly prohibited. Can I resell the customized OpenCart design for Mens Jewelry ? No, you cannot resell the customized OpenCart design for Mens Jewelry as a template but you may sell it as a project to your client (see paragraph 1 ONE TIME USAGE LICENSE for more details).